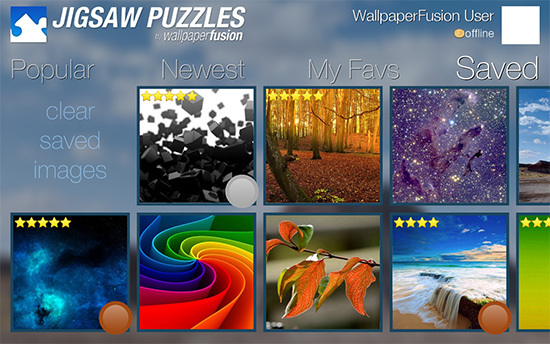 Jigsaw Puzzles by WallpaperFusion 1.6 Now Available! We're pleased to announce that the latest update for Jigsaw Puzzles by WallpaperFusion is now available for download! This release includes major improvements for playing puzzles offline. The app will now start up directly in "offline mode" when starting without an internet connection, and offline images are more reliably saved to ensure that your saved puzzles are always accessible! As well, recent updates to Jigsaw Puzzles have added the ability to rate images from within the app, as well as bug fixes and performance improvements when navigating between pages of puzzle images.